Basic Outfitters was founded in 2014 by Laura and Michael Dweck with the intention of helping men to build their basic collection of items such as underwear, socks, and tees for a low price. Since then, they have been featured on Shark Tank, their products have been seen in Vogue and GQ and the couple was selected for “30 Personalities Under 30 to Watch” by Forbes. Continues to collect emails long after Shark Tank event. Why did you decide to use WisePops and what features were you looking for? We were looking for different Pop-up services for our site. Ultimately we chose Wisepops for its simplicity and ease of use. What have been your most successful campaigns? Our Email signup on the homepage. We had this enabled when we were featured on Shark Tank and a number of emails we collected have been invaluable. You have excellent conversion rates on some of your campaigns, 15% – 30%. What did you do achieve this? 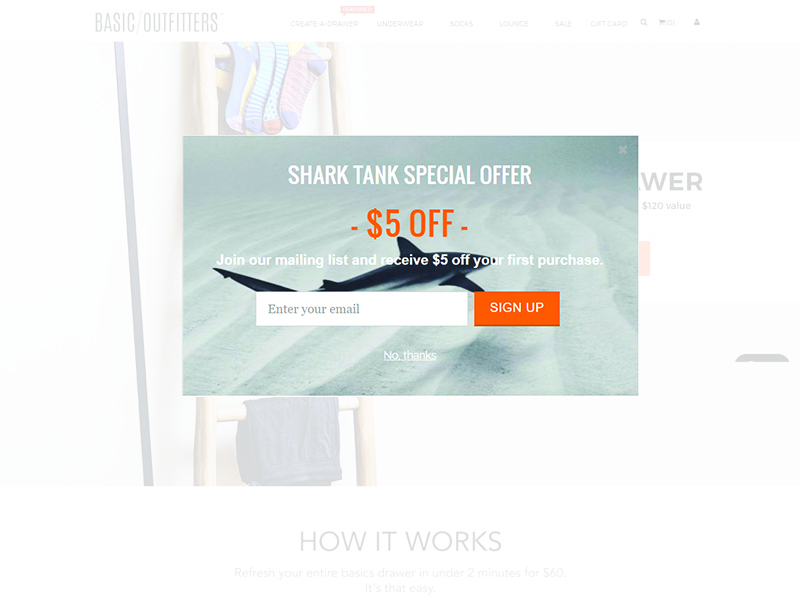 What advanced features (A/B Testing, Tab, Advanced Targeting, etc) have made the most difference for Basic Outfitters? AB testing is key. Testing different copy, images, offers. It allows us to figure out what really works. Greg D'Aboville Greg is Head of Growth at WisePops.